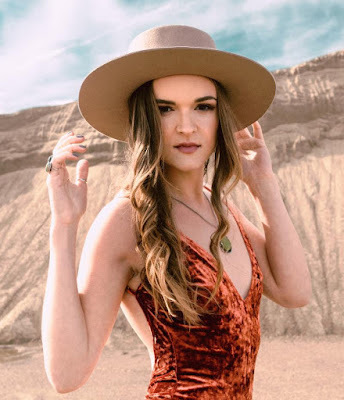 Lovin' Lyrics Music Promotions: CMT ARTIST DISCOVERY EXCLUSIVE PREMIERE OF HANNAH BETHEL'S VIDEO "TRAIN"
CMT ARTIST DISCOVERY EXCLUSIVE PREMIERE OF HANNAH BETHEL'S VIDEO "TRAIN"
'We are so excited to be supporting Hannah Bethel - she's a great storyteller. Take one listen to 'Train' and you will be singing it all day!" Rising independent artist, Hannah Bethel's music video for her latest single, "Train," will air in an exclusive CMT Artist Discovery broadcast premiere on CMT Music and online at CMT.com on Tuesday, Dec. 4th. CMT Music approximate air times for "Train" on 12/4 are slated between 6:50-7:50am, 12:45-12:55pm and 11:40-11;50pm. The video will Premiere at CMT.com at 12:00 Midnight at this link: www.cmt.com/video-clips/wxob8n. (All times listed are ET). Bethel's "Train" video will air 3-times each day on CMT Music for 6 weeks and be eligible for extra spins on the CMT Music 12-Pack Countdown. The CMT Artist Discovery also includes CMT.com homepage promotion, and CMT social media and editorial platform promotion for Bethel and "Train." The powerful and hauntingly beautiful music video was filmed and directed by Dawson Waters in the mountains and deserts of west Texas. "Train" was co-written by Bethel and sister, Wynter Bethel, and produced by Brad Hill and Lalo. "I have always loved the art of music videos and telling the visual story of a song," states Bethel. "I've been watching CMT since I was a kid and I am so honored and so excited to be supported by them!" Bethel's artistic vision and growing critical acclaim places her at the vanguard of the best and brightest rising recording artists in Nashville today. A tireless performer and songwriter since her teens, Bethel has spent the past decade releasing music independently and garnering accolades all along the way. Her well-developed and unique style influenced by the greats of Country and Seventies Rock has led her to receive high praise from such renowned music industry critics as Robert K. Oermann and Chuck Dauphin, major radio personalities including Bill Cody and Devon O'Day of WSM, and rave reviews from leading media outlets such as prestigious Billboard, MusicRow, and Maverick Magazine. In another major step in her upward career trajectory, Bethel was recently welcomed to become a member of Nashville's prestigious Song Suffragettes, a trailblazing organization founded by Todd Cassetty and a leading member, independent artist, Kalie Shorr. Song Suffragettes is a collective of female singer-songwriters that performs every Monday night at The Listening Room Café in Nashville, TN. In just over four years, Song Suffragettes has showcased over 200 talented women out of over 1,300 who have submitted to play the showcase. With a mantra of #LetTheGirlsPlay, Song Suffragettes vocally combats wide-spread discrimination against women in the music industry by giving female talent a place to play, grow and evolve with fellow creatives. Bethel currently maintains a busy performance schedule of solo acoustic shows and with her band Hannah Bethel and the Gypsy Queens. She has toured across America from Alaska to New Jersey and everywhere in between, and shared the stage with such artists as Joe Nichols, Rodney Atkins, Trisha Yearwood, Charlie Worsham, Buddy Jewell, Frankie Ballard, Canaan Smith and Nine Days, among others.